1.Earnings…Positive Sales Surprise Slow Down. 3Q earnings did not materialize as the positive catalyst investors were hoping for following Powell PBS, Pence China speech & US-China sentiment deterioration, PPG pre-announcement, IMF global growth downgrade, etc – all in early October. The qualitative commentary from Q3 included slowing demand in China/EM/Europe (particularly auto), margin pressure, and trade war impact. 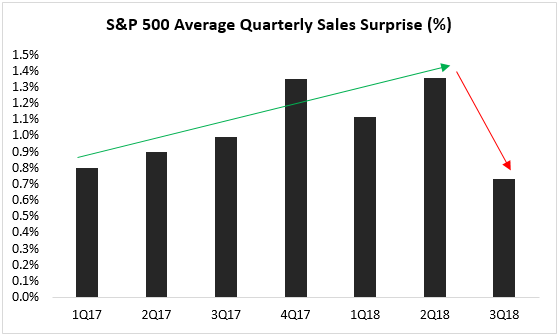 The average sales surprise was the lowest going back to 1Q17 – breaking a largely positive surprise trend over the prior 6 quarters. 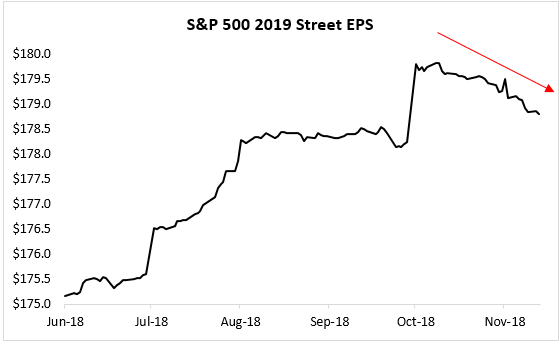 Through and following Q3 earnings, 2019 consensus EPS has been revised lower. 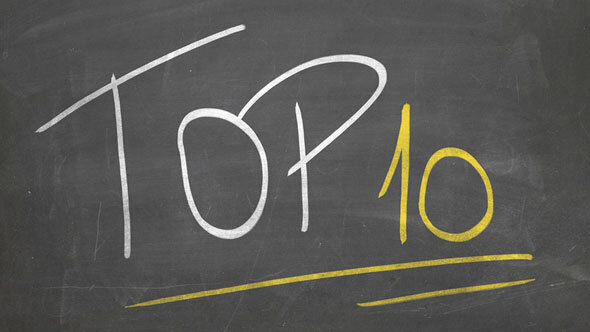 Again, the trend is more worrisome than the dollar amount – thus far – reduced. 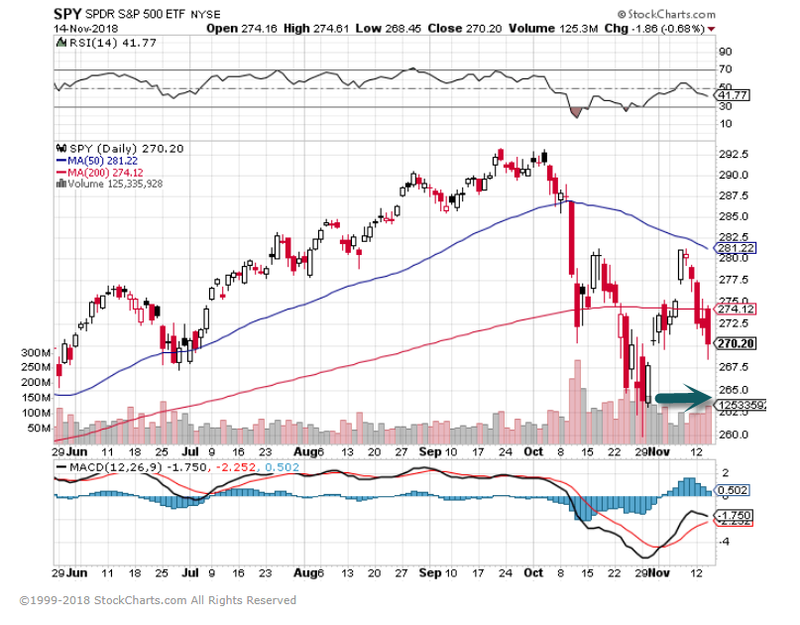 2.All The Technical Traders Talking About Testing the October Low. 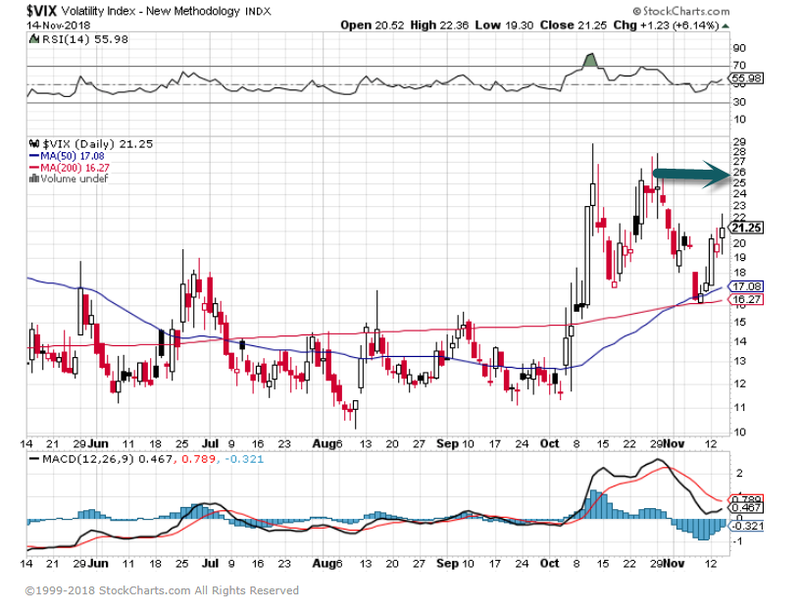 VIX Volatility Index..Will It Break to New Highs? 4.Interesting Look at Chinese Tech Premium Shrinking. The long-term potential in Chinese tech firms may be underappreciated amid strained U.S.-China relations. Richard explains. It’s been a tough year for Chinese technology stocks. The fast-growing sector has led emerging market (EM) indexes down amid rising U.S.-China tensions. 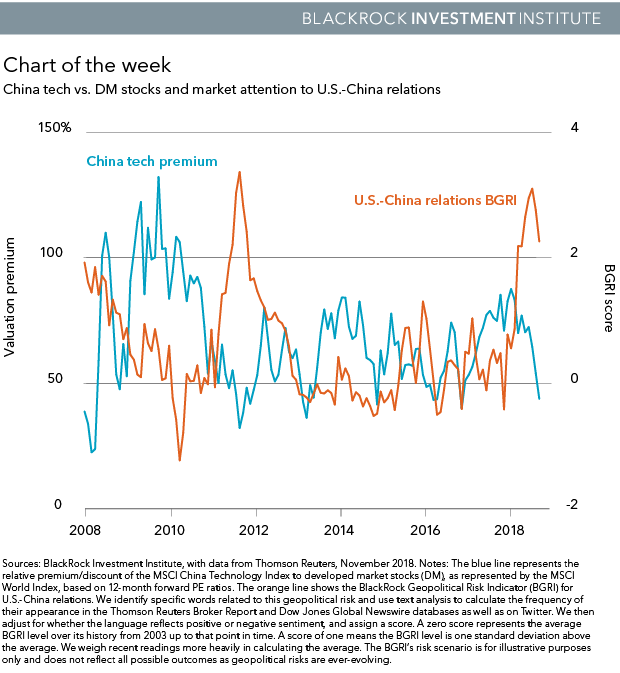 The upside: The decoupling of Chinese tech from U.S. peers is set to accelerate amid a struggle for tech dominance, giving it diversification benefits. 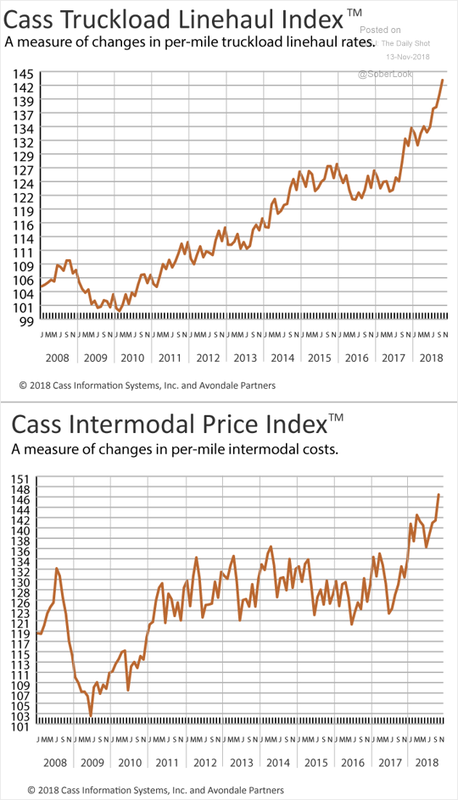 And valuations have fallen. 5.Oil 12 Straight Days and Counting…Not Even Close to 1 Yr. Lows Yet. 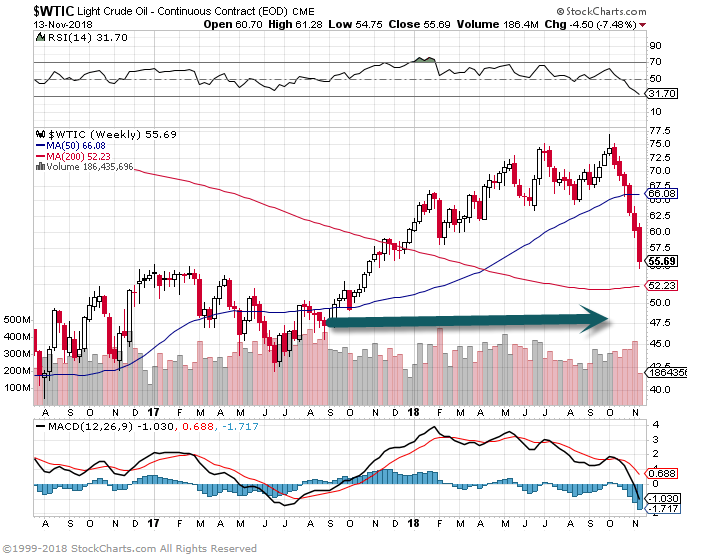 Crude oil…Still well above 2017 levels. 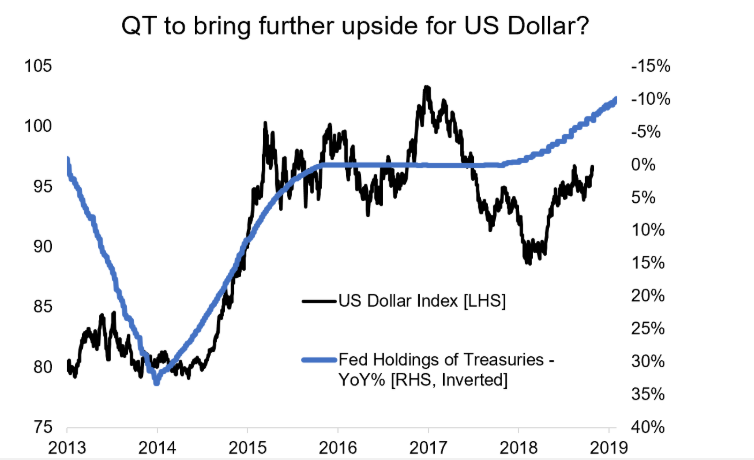 6.Dollar Has Been Following FED Holding of Treasuries…Could Be More Upside. 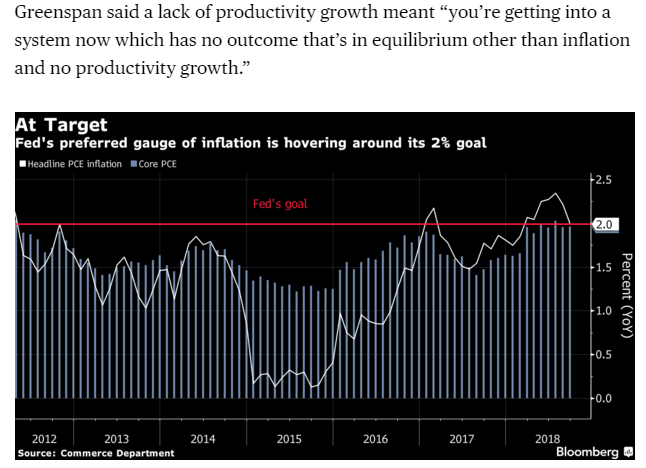 7.Fed’s Favorite Inflation Gauge Hovering Right At Target…Watch for Move Above. 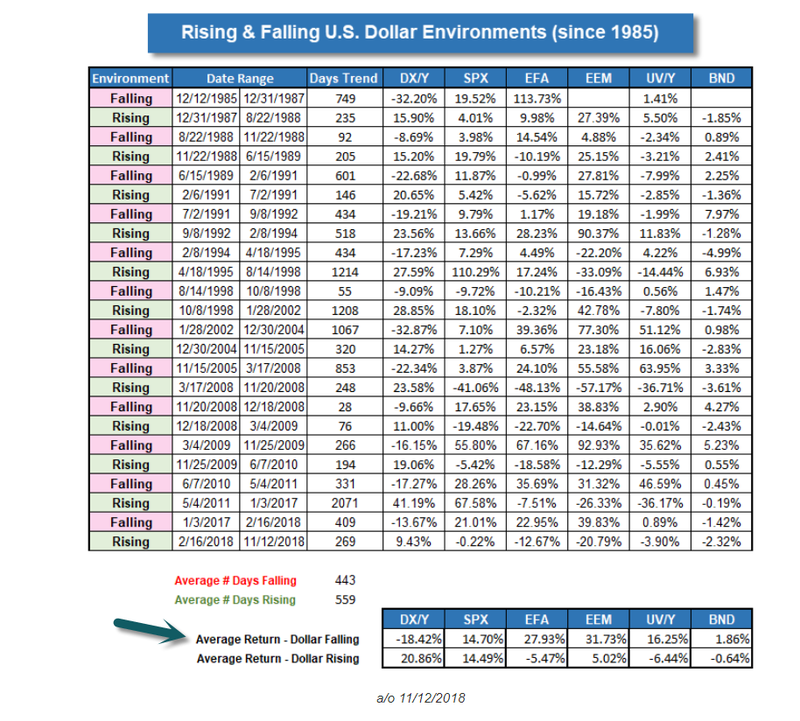 8.Rising And Falling U.S. Dollar Environments Since 1985. Uber reported its third-quarter financials to select media outlets on Wednesday. 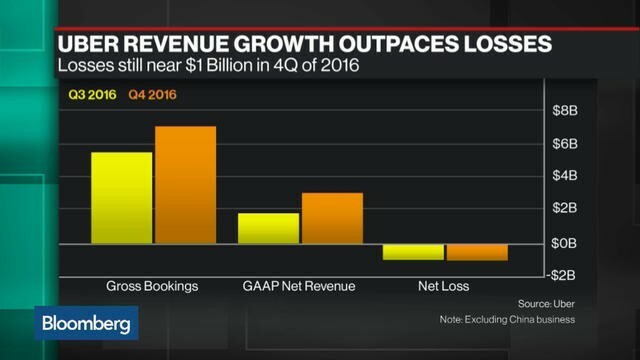 The numbers show widening losses and slowing growth as the ride-hailing giant races towards a public stock offering. It’s the first time the company has provided specific data for Uber Eats. Uber has released its in-house financials for the third quarter. The numbers show widening losses and slowing growth for the ride-hailing giant as it races towards an IPO as soon as next year. Revenue: $2.95 billion, up 38% from the previous year. Adjusted net loss: $939 million, up 38% from the previous quarter. Gross bookings: $12.7 billion, up 34% from the previous year. While revenue is still climbing steadily, the increase is much smaller than its 63% year-over-year jump in the second quarter, according to the Wall Street Journal. Uber Eats accounted for $2.1 billion of overall gross bookings, and is growing at more than 150% annually, according to Tech Crunch. It’s the first time Uber has broken out specific data points for the service, which is also now included in Uber for Business, allowing employees to expense meals in addition to rides. As it eyes an IPO as early as next year, the company is looking to trim its losses and increase recurring and diverse revenue streams, both of which Wall Street will be looking for. It’s even reportedlyconsidered selling off a minority stake in its cash-intensive Advanced Technologies Group, which handles things like self-driving cars, to help with cash burn. Uber is racing towards an IPO as soon as next year, with reported valuations as high as $120 billion. Lyft, its much smaller but still closest competitor, is also aiming to go public, with a valuation near $20 billion. Lyft has already signed on Credit Suisse to assist in the book-running for its listing, with others reported to also be on board. There’s still no word on when exactly the company may file its registration statement with the Securities and Exchange Commission, but investors will likely be clamoring at the gate when Uber heads to Wall Street. In October, Uber sold $2 billion worth of high-yield bonds in an oversold auction that had more demand than could be fulfilled. Ryan Arcidiacono has this annoying little flaw. He often doesn’t get out of the way when you think he’s supposed to, like Saturday in the United Center, when the Cleveland Cavaliers with 13 seconds left in the game lined up a play to go at Arcidiacono for a win. Arcidiacono forced rookie Collin Sexton into a miss and Jabari Parker followed up with a block on Sexton’s second effort to insure the Bulls 99-98 victory. Arcidiacono also was supposed to get out of the way two years ago when no NBA team chose to select him in the 2016 draft, when he was waived in training camp by the San Antonio Spurs and spent the season in the G-league. And then when he tried to go play in Italy the deal fell through and he ended up with the Windy City Bulls. An NBA player? Nice kid, tries hard, but, really? This is the NBA. Well, Arcidiacono not only got there with the Bulls this season, but Saturday the 6-2 point guard started his first NBA game, set a career high with 15 points making three of four three pointers and had as big an impact on the game as any of his teammates, recording a team best plus/minus game rating. Arcidiacono’s development and improvement, as unlikely as it’s seemed, is one of the feel good stories of the NBA and another encouraging G-league narrative, that if you commit yourself to compete and improve, even you can be an NBA player. Well, not quite everyone. But no one thought Chicagoan Alfonzo McKinnie was an NBA player. But with stints at Windy City and the Toronto G-league franchise, McKinnie is now a vital player in the rotation of the champion Golden State Warriors. Most believed when Arcidiacono made that game winning pass to Kris Jenkins for Villanova’s 2016 NCAA championship, the hard working little guard was going to have some great stories to tell his insurance clients. Look, nice story, but let’s get serious. It’s the league of LeBron and KD and, OK, Steph, but did you see how he shoots? Arcidiacono had herniated disc surgery in high school and finally made second team all-East as a senior. Second team? He never averaged more than 12.5 points in college and not double figures in Summer League. Summer League? C’mon kid, you almost could hear the NBA guys saying, you’re in the way. Which is perhaps the best thing about Ryan Arcidiacono. He doesn’t accept assumptions or defeat. So he fell in love with Hoffman Estates. It’s not the attitude of some G-league players who resent the circumstances. But the G-league is becoming a vital feeder for the NBA, and Arcidiacono is one of the prime examples. “You definitely have your fair share of guys who think that (they shouldn’t be there),” Arcidiacono agreed. “But it’s more about embracing it and making the most of it. Because if you have one foot out of the door while you are there you’re not going to get what you can out of it and improve. “I liked it a lot,” said Arcidiacono, who is now 24. “I got my foot in the door with an NBA team. I think the league itself is a good transition from college to the NBA and a professional life-style. It definitely fit me. Charlie (Henry, coach) worked on my shooting a ton with (assistant) Jannero Pargo. I was with Fred all summer, coach Nate (Loenser). They really tried to emphasize things in my shot, to shoot with confidence and put me in situations to be successful. They helped me extend my range and have that solid base. I really learned. “I couldn’t really envision this from a year ago,” Arcidiacono admitted. “I feel I’m a confident person and I felt I could play in this league. So I’ve been chipping away at it. A player like me—I don’t want to beat on myself about the athleticism I don’t have—but it’s probably a little bit tougher (to make the NBA). So you grind away and take it day by day and just try to find the little things you can do to help a team in a game, in practice, trying to help in any way you can. “I never took it as ‘No one wants me,’” Arcidiacono said. “I just tried to get better. From where I was last year, it shows anything can happen. So stick to it and try to make the most out of it and not give up on that NBA dream. If someone like me can make it here and have an impact, it shows you can be a leader without playing a lot, that you can help a team without playing a lot, which I felt I did last year and this year and this summer, and you gain respect. Whether you are playing a lot or a little, you can still be the most vocal and the hardest worker. Something for everyone to think about.